Video Production: It Just F***ing Works – Part 1 – Varnish Lane! Its always difficult to quantify your marketing into real dollars. You know how much time and money you SPEND on it, but how much of that will go back to your company? How much will you make ON TOP OF the initial investment you get back? How much of it is just flat out wasted? Well, the answer is I have no idea. What I do know, is more times than not, video helps. VIDEO MAKES YOU MONEY. People connect with video far more than they do with other forms of marketing. into marketing. Things like revenue and growth rates before and after launching a campaign, sales and click-through rates for products advertised, etc. But every so often we get some really great case studies, that have a thicker line, a more defined path that goes directly from the decision to hire a professional video production company (like the fine gentlemen at SkipperFilms) to produce a promotional or brand marketing video, and success. Some of these examples include Kickstarter campaigns that get funded after they implement video, or pitching your idea to an investor group. This is one of those success stories. Varnish Lane is a waterless nail care destination in Washington DC. What that means is they don’t use traditional methods of nail care that involve running water, and therefore relieving some of the health and infection issues that go hand in hand with other traditional nail salons. A somewhat difficult concept to visualize, but a genius idea! So, they commissioned a video when they were selected by an Angel Network to present at their monthly event. The event, in which they have 2-3 companies give a 15 minute pitch to their members, allowed the 2 minute video the perfectly explained the nature and niche of their business to play at the very beginning of the event. 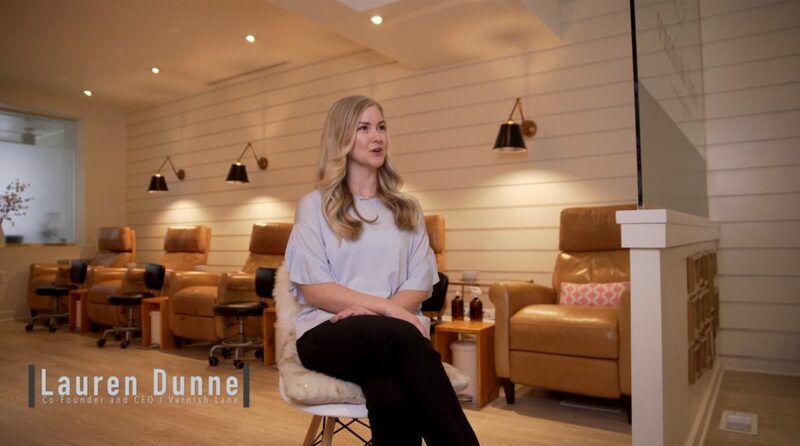 By taking that step in deciding to hire SkipperFilms to produce their corporate promotional video to help their pitch (and also place on their website upon update), Varnish Lane successfully convinced an Angel investor that their wonderful shop is 100% worth the investment. They were fully funded and have a bright future ahead of them! So while a lot of marketing efforts all play a small, untraceable role in your company’s success or growth, these cool case studies that lean a little more on the video production element, tell a clearer story of how much video can boost your business! Tune in next week for another case study, of another company, with another success story due to a video we created for them. I’m going to sound like a broken record, but I’m just trying to drive the point home that Video Production JUST F***ING WORKS. Do you own or work for a business in the Washington DC, Virginia, or Maryland metropolitan area looking to hit the gas and drive your marketing through the roof? Reach out to us through our Contact Page to start the conversation. Even if you just want a little information about what we do and how we can help you, consultations are always free! Previous post Staccato Stationery Promotional Video Release!